acid in stone fruits etc.). Perhaps we should close down the greengrocers… Just as the human race has consumed certain fruits and vegetables for thousands of years, so it has used whole herbs medicinally. The knowledge of what works and what doesn’t has been passed down the generations – this is the knowledge of experience – and to many people this is sufficient evidence to use herbs medicinally. Orthodox medicine’s criticism of herbalism is old hat. Requiring herbal medicine to prove efficacy using methods designed to develop medicines from single bioactive compounds is never going to work. Herbalists shouldn’t even attempt to play a game where the rules are skewed in favour of the other team. In any case, it’s not a competition. have you got any evidence to show that giving a wholeplant as a herbal medicine is better than giving an extract? i’m not saying it doesn’t exist, i’d just be more interested to read it than this slightly dreary bombast. Isn’t the natural behaviour of a plant to poison anyone who eats it, until we learn not to eat it? Except for those that we have tamed and learned to defuse. Which bits to eat, which not. Potato fruit for instance. There appears to be no reason not to conduct a study using, lets say Hypericum (St. John’s Wort) in which half the subjects receive a standardised extract and the other half receive an equivalent amount of whole herb – from the same crop as the extract was obtained. Who shows most improvement? Let’s see. Repeat this for other herbs, blinded and controlled for, obviously. My herbalist friend, whom I already mentioned, blamed the peer-review process for research not getting “through” to mainstream, but when I suggested the above, he went on about the lack funding instead. So which is it? Either the studies are flawed due to lack of funding (so don’t blame peer review) or they are not (in which case they will pass peer-review). None of these concoctions has ever been tested in the West by random double blind controlled trials. Are we to conclude then this whole healthcare system is unsound? Are these so called remedies ineffective, or worse make people ill? How can a system that treats so many people be so flawed? Herbalists use whole plants medicinally. Medics use single bioactive compounds medicinally. Why should herbalists who use whole plant medicine provide evidence of efficacy for extracts, even if these are from plants? Single bioactive compound research is orthodox medicine’s area of speciality. If you want evidence for the efficacy of active ingredients from plants, then speak to medical scientists, don’t ask herbalists. Extracted, concentrated active ingredients are no longer ‘herbs’. Orthodox drugs were originally synthesised from plant extracts (like digoxin), but we don’t call them ‘herbs’ and herbalists can’t prescribe them. Ben’s point was that someone needs to prove that a whole plant is *better* than an extract, before they go around saying that it is. The original article makes an interesting subtle turn of logic. There are herbs, and other things in nature, which when concentrated are dangerous. Some of these are used in medicine and are dose critical. The false logic in the orinal article is that because some substances need tight control, then all substances do. Many substances are not that dose critical and the herbal substances that can cause harm in excess are well documented. Depends how you define “better”. The main issue in my mind is side-effects. I’ve seen people crippled with the side-effects of statins for example. I believe herbals do not to have side effects (at least not to the same extent). In my book that makes them “better”, but they will not be as powerful or may take longer to become effective. I can call to mind an example. I sometimes used to get colds that went onto my chest and I could not get rid of the damn thing for ages, and eventually had to go to the docs for anti-biotics. Last year the same thing happened again, but instead of going to the docs I thought I’d try echinacea (6 caps in one day). On rising the next day, I ejected a most revolting load of green phlegm and that was an end to it. Not a single cough after that. In my mind it was “better” than the anti-biotics because it was much faster and anti-biotics can cause gut dysbiosis. Also, sometimes the antibiotics in the past had been completely ineffective and I’d had to go back for more. My doc says he has to keep changing them because I could become sensitive to the same one and eventually they would not work. Now I take Echinacea at the first sign of colds/sore throat and it always helps. The Mayo clinic says “A National Center for Complementary and Alternative Medicine study released in 2005 found that echinacea did little to prevent or shorten colds.” The clinic also says “Most studies indicate that zinc reduces the duration of cold symptoms but doesn’t prevent colds. However many of the zinc studies — both those that find the mineral beneficial and those that do not — have been flawed”. Why do we have so many flawed studies? They cost so much, you think we’d have learned to get them right by now! My point is that just because there is no study backing it up does not mean it does not work. I never said these things don’t work, and neither did I ask about additional bonuses, such as fewer side effects. Don’t misunderstand me. All I asked was for evidence to show that treatment using a whole plant is more effective than treatment using an extract from the *same* plant. It’s a claim herbalists make, and is pretty crucial, so why not prove it true? It was Ben’s point, not mine, I believe. i’d actually really be interested to see some evidence for whole herb vs extract, i assume there must be some somewhere? all this stuff about using stuff at low doses so there is no effects or side effects and anecdotal little stories is like the homeopathy nonsense. seriously, herbalists, whole herb vs extract, please, we want to read about it, give us some evidence. if there is some you dont have to deliver it in a triumphalist tone, just post the journal reference. >>Don’t misunderstand me. All I asked was for evidence to show that treatment using a whole plant is more effective than treatment using an extract from the *same* plant. Sorry , I did not realise this blog truncated so abruptly. Sorry , Arrows seem to upset this bolg, I’ll try try again.. ! !Don’t misunderstand me. All I asked was for evidence to show that treatment using a whole plant is more effective than treatment using an extract from the *same* plant.!! No you did not. you said ! !someone needs to prove that a whole plant is *better* than an extract, !! But you did not define *better than*. More effective is not the same thing. What do you mean by more effective? Works quicker? Cures more people? Please be precise. OK, I’ll try again too. (I actually said someone needs to prove it *before* they go round *saying* it – that’s what I asked for). Lets set aside value judgements like “better” for a minute. What research has been done on the difference between administering a whole plant compared to an extract from the *same* plant? Not compared to pills or drugs, exactly, simply between whole herb vs. standardised extract? For example, my herbalist friend asserts that using whole Kava Kava is safer than using an extract of kavalactones, because, I’m told, the natural glutathione present in Kava supports the liver against the otherwise toxic kavalactones. Whether this is an evidence based belief or a conjecture I do not know. It asserts that the issue is the concentration of kava pyrones. The issue as Ben points out in the original article is not the safety of the original plant, but its efficacy. Extracts can be much more powerful and so their dose must be controlled. Doses from the original plant can be variable. “someone needs to prove it *before* they go round *saying* it ” Individuals obviously do not have the resources to prove things for themselves. So they will deduce things for existing research. Obviusly, I agree that all statements should be supportable with evidence. In this case, IMHO there is evidence to support your herbalist friends statement (but you may disagree – as you are entitled to do). Thanks, hope I didn’t muddy the water by bringing kava into it specifically. I mentioned it only because its something I have personally enjoyed using. I’m fairly familiar with the cases you cite. Thing is, traditionally kava is used for pleasure, for celebrations, for ceremonies, not healthcare, so a long historical use tells us nothing about the efficacy of kava for treating anxiety or insomnia. Also, it is traditionally prepared by everyone standing around, chewing it up, and spitting into a bowl. I don’t think it has ever been used in the west this way. Indeed, simply ingesting the plant without chewing is not supposed to release the kavalactones. So at best an an alcohoic tincture is prescribed, if not a standardised extract. All I’m saying is, there’s a gulf between what we know for certain about Kava and what is claimed. Perhaps chewing with human saliva is the process which renders kava safe. Does this make it more or less effective for healthcare? We do not know. Most of the cases of harm did involve other drugs or alcohol, apart from the two cited in those studies, so even the evidence that kava harms the liver is inconclusive, in my veiw. Which is a pity, because I for one would like to use it again. So the debate continues: is a whole herb more or less than the sum of its active ingredients? Furthermore, you cannot directly compare a whole herb to its active ingredient extract because a herb is a herb and a chemical is a chemical and never the twain will meet. To say, for example, digitalis=digoxin is to commit a category mistake and is meaningless. But hey! 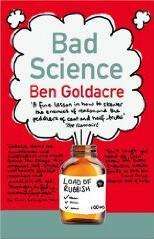 We’re in Ben Goldacre’s bad science universe – enter through the crack in the fabric of logic and don’t forget to take your broccoli pills. Have you heard the latest? Herbalists and Homeopaths are colluding to drive down the dosages of their remedies in order to make them ineffective – someone call the Competition Commission! Am I correct in thinking that little temper tantrum was precipitated simply by someone asking for a reference? References? Google not working for you? If you can’t find any, then they don’t exist – for reasons outlined above. I’ve had more satifying interactions with my dog. This time it really is over and out. As a reader, I just thought I’d mention that your contribution was much appreciated by me. I came in late to this debate, but I’ve learned a lot. Ben is a past master at handling himself – you really did not expect to make an impression did you? He’s bullet proof. I’ve spent years trying to discover why people who deride CAM therapies do so. I believe that they believe they are a waste of time or money making scams or else they are put up to it by the pharamas. There is no easy answer – they have their world view and I have mine, which is decidely different. I’m not sure whether the outright ban on kava was justified by the data either. But have you ever tried preparing it with just water? Drinking an infusion made with water does not produce a sensation, while chewing it, on the other hand, produces an immediately noticeable numbness in the mouth. I’ve no idea whether this is the active ingredient being extracted, but there is definitely something extra from chewing. to modern western consumption. Too many unknowns. More data needed. Although it is the case that I would still feel fairly confident about chewing it up and consuming it myself, there is no way I’d recommend anyone to do so, especially not as a treatment for a medical condition. Ben’s insistence on research is far from unreasonable, its the only responsible way to approach this kind of thing. Of course. Research is the way we move foward our understanding. However, sometimes evidence comes from observation and deduction, and that’s all there is. I thought a bit about this question and concluded that for some hebal remedies, dose is not too big an issue, but for others it is. We know that humans are sensitive to nightshade, hemlock, foxglove etc., and for these dose is crucial when being administed as a medicine. The extract method does this. So I do not think there is an answer, all substances have to be taken on their merrits. I do think it strange though that a herbal interfering with a medicine is thought of a “side-effect” of the herbal. I know grapefruit interferes with some medicines (makes them too powerful) – does that mean grapefriut has “side-effects”? And it might well transpire that in some cases extracts have greater efficacy, while in other cases whole herbs do. Regarding grapefruit, yes, I would say that any unwanted effect is a side effect (sustenance or pleasure being the desired effects from grapefruit, presumably). you’re talking about interactions, not side effects. So is inactivating a contraceptive pill an interaction or a side-effect? can i just say: it sends an actual chill down my spine that the herbalists posting here didn’t know that. you prescribe things to patients all the time which have potentially very serious interactions, many of your patients will already be on other medications, and you don’t even know the word. For me, the real issue about herbals is the side effects. St. John’s wart is known to interact with anti-depreseants and other medications, which is why you should not mix the two. It can also have the self-same side effects as prescription medicine. However, the reaction differs in different people (some are better off with St. John’s wart, some with prescrption medicine). Like everything it’s horses for courses. Ps. I have a Hypericum bush in my garden. I’m not about to dig it up – caps are much easier (not that I’m depressed). Don’t be daft, of course I new it was an interaction, but research would revel that I am not indeed a herbalist. I’ve been pressing my herbalist friend on evidence for the concept of “synergy” but sadly he seems too busy to provide me with actual links to studies, which he is adamant do exist. The example he keeps raising it that of St. John’s Wort. This, he says, is demonstrably effective as an SSRI (and has a similar influence on dopamine as it does on sertonin) but he maintains that medical science, despite having proved this, does not now how or why it works. According to him, no extract of the plant functions as an SSRI, only the mysterious combination of chemicals in the whole herb. I am wondering why capsules are sold with a standardised level of hepericin in this case. What are you thoughts on this? My research skills are not awesome, but I do intend to try and find whatever studies might be available. Meanwhile, I did listen to a Podcast from Sciantific American last month, on which an ethnobotanist gave a fascinating description of his job, liaising between drug companies and indigenous peoples, using their tribal lore to pinpoint potential combinations of herbs that might have synergistic effects amenable to research. This seemed like rather a turn around to me, so it caught my attention. Right, OK then, I have done my best, scouring Pubmed and other sources for any sign of a study that compares the efficacy of whole herb Hypericum P. (St John’s Wort) treatment of depression with that of isolated compounds, but I can find no such thing. For sure, Hypericum contains a vast array of compounds capable of exerting a serotonergic or dopaminergic effect upon the nervous systems of humans or animals, and some studies do suggest that the compound hyperforin is especially active in these roles. While it must be the case that a whole-herb treatment will include action by many or all of these compounds, I have been completely unable to uncover any research that compares the efficacy of compounds to each other or combinations of the same. Certainly these things are amenable to research, and the individual effects of certain compounds has been studied, as has the efficacy of the whole herb when compared to standard pharmaceutical treatments. And yet, there seems to be nothing to support or refute the claim that a whole herb treatment has greater efficacy, or is preferable on some other grounds, when compared to isolated compounds. Neither does there seem to be anything to suggest that a designed combination of compounds would necessarily be inferior to a naturally occurring one. I tried, but I just don’t think the research has been done. Gonzo, you misunderstand. I am aware there a numerous studies comparing whole St. J’s Wort to other pharmaceuticals. My friend suggested that Hypericum was just such an example. So I trawled through every study I could find. What I discovered were studies that a) show the whole plant works, and b) studies that show parts of the plant work; but no studies looking to see whether the whole plant works better than parts of the plant alone, or in what circumstances this would be true. Had I found such a study, I would also have wanted to ask, can we also test a *designed* combination of constituents against a naturally occurring combination of constituents, to see if we cannot improve upon the combo found in nature. Ben’s point is a trueism. I do not think it can be answered or disputed. If one cannot justify a point, it must be made up (or copied from a source that made it up). (and note as stated it does not preclude any way of justifying any claim). I really don’t understand how you hope to answer the point. Ultimately we can always refine our knowledge, yes, I was simply interested in whether anyone had bothered to do studies comparing these things. It appears not. I think you are right about no studies having been done. I had a look at white willow compared to aspirin. I could not find any of these either, but in studies of white willow vs pain killers, white willow had significantly fewer side effects, but may not have been as effective. Interesting. But as aspirin is exactly the same chemical as is found in white willow bark, I now want to answer this: are there fewer side-effects because it is a weaker dose, or is some additional ingredient responsible? Should it be the latter, would extracting this additional ingredient and administering along side aspirin allow for strong effect AND fewer side effects, or not? I’m not sure how you would tell that. This paper (page 330s) says that there was a small but significant increase in gastric bleeding at doses as low as 75mg/d of aspirin. I don’t know what the relationship between salicin and aspirin is, but at face value, it would appear to be the other components of white willow that protect. (but white willow can have side-effects too). Salicin is a single molecule extracted from willow, not the whole plant. It is chemically very close to aspirin, though not identical. The difference in dosage and efficacy may not be completely comparable. The aspirin I have in my cupboard is in 300mg capsules, and up to three may be taken at once, up to four times a day. Perhaps the intestinal bleeding you mention is from prolonged use? If white willow bark is used whole, say as a tea, then several thousand milligrams of whole herb are used. The advice is to have no more than three cups a day, as it is not possible to say how much salicin is in the actual herb. It’s all too vague to really compare, but the safe dose of salicin you quoted has nothing to do with what’s in white willow as a whole, as it is only one chemical extracted from the plant being discussed there. It’s also assuming that the unspecified no-side-effects studies on willow would have detected gastric and/or intestinal bleeding – btw which is it, as far as I recall it’d be the stomach but I’m not a doctor or a scientist. I thought that was the point: comparison of the active herb ingedient vs the active ingedient in aspirin. To get some sort of answer to your question, you need the active ingredient in the herb to exceeed the quantity of active ingredient in the drug and the herb to be safe and the drug to have side-effects. Or the converse (herb is only safe at low dose of active ingredient). “Perhaps the intestinal bleeding you mention is from prolonged use? ” I’m sure that is so. But the article did state that this is the most significant side-effect. Yes Robert, that may be so also. I only posted for interest, conclusive results are going to be hard to find. Salicins are found in a number of plants including white willow and meadowsweet. Salicins are converted into salicylic acid by the body when ingested. Aspirin is acetylsalicylic acid and is a synthetic derivative of salicylic acid. It is fairly easy to ascertain the differences between apples and oranges though – that is definitely amenable to research. (Thank you Ben, I have had many laughs reading Bad Science over the last week, even though I’m officially in the enemy camp) Re: Give me some evidence that giving a whole plant is frequently a better idea. I guess one plant only needs to be better (more efficacy, without more side-effects)in one scenario to prove that such a possiblity exists. Natural complex substances are often attributed “superior” effects to constituent chemicals because of synergy, a concept not unique to plant medicine. I find it curious that almost all conventional medicines are single chemicals when synergy is such an appealing notion – more bang for your buck! Of course there are a few mixed drugs, and not all mixtures are synergistic. Synergistic interactions are of vital importance in phytomedicines, to explain difficulties in always isolating a single active ingredient, and explain the efficacy of apparently low doses of active constituents in a herbal product. This concept, that a whole or partially purified extract of a plant offers advantages over a single isolated ingredient, also underpins the philosophy of herbal medicine. Evidence to support the occurrence of synergy in within phytomedicines is now accumulating and is reviewed here. Synergistic interactions are documented for constituents within a total extract of a single herb, as well as between different herbs in a formulation. Positive and negative aspects of interactions are discussed together with the methods used to identify and measure synergy. The evidence is divided into experimental, in vitro instances, as well as clinical examples where available. Herbs discussed include Ginkgo biloba, Piper methysticum (Kava-Kava), Glycyrrhiza glabra, Hypericum perforatum, Valeriana officinalis, Cannabis sativa, Salix alba and others. I have examples of the third type of synergy, but I guess they would not address your argument. Not much clinical evidence here. And, on that note, I presume you regard in vitro or animal evidence of toxicity with the same degree of circumspection that you reserve for in vitro or animal evidence of a plant’s efficacy? At last science shows us a herbal that might help acne better than patent medicine! (due to diminished side effects).